Once creatures suffer a certian amount of damage in combat things begin to get worse for them. their injuries beyond this point are less in the order of grazes, stratches and flesh wounds and more in the order of life threatening injuries Any creature reduced to less than half it's regular hit points is considered to be Battered. Battered creatures are noticeably battleworn suffering a -3 penalty to all saving throws. Characters must declare when they become battered, The DM will declare when NPCs or monsters become battered. A character with 0 hit points, or one who has negative hit points but has become stable and conscious, is disabled. A disabled character may take a single move action or standard action each round (but not both, nor can he take full-round actions). He moves at half speed. Taking move actions doesn’t risk further injury, but performing any standard action (or any other action the DM deems strenuous, including some free actions such as casting a quickened spell) will require the character to make a Fort save (DC 10 + your negative hp value). Failure will cause the character to suffer 1d4 points of damage. Unless the action increased the disabled character’s hit points, he is now in negative hit points and dying. A disabled character may recover hit points through natural healing. When your hit points drop to 0 or fewer, you fall unconscious and are dying. In most cases unconscious characters fall prone in their space. Any additional damage you take continues to reduce your current hit point total until your character dies. Death occurs at the a negative number equivalent to the characters con score plus their character level or HD. Fort Saving Throw: When you are dying, you need to make a stabilization Fort saving throw (DC 10 + your negative hp value) at the end of your turn each round. If you fail this save you take 1d6 points of damage. Stabilize:If you succeed at two consecutive saves since your last injury or receive first aid from someone using the heal skill you make no further saves and are stabilized. You remain unconscious. Critical Success: If you roll a natural 20 on the stabilization Fort save you regain 1d6 hit points, if this brings your current hit point total above 0 you may immediately make one standard, move, or swift action. Only key characters such as PCs or major NPCs may critically succeed at stabilization saves. When an elite character such as a PC is dying, any healing restores you to at least 1 hit point. Regain Hit Points Magically: When you are dying and receive magical healing, you go to 0 hit points and then regain hit points from the healing spell or effect. Regain Hit Points Naturally: You heal negative hit point damage at twice the rate of regular hit point damage, this includes natural healing, fast healing, and regeneration. Not elite characters who recieve healing stabilize but remain unconcious unless their HP total exceeds 0. A character who still has negative hit points but is no longer dying is stable. Stable characters who have received no medical attention are still at risk of succumbing to their wounds gradually. If the character has become stable because of aid from another character (such as a Heal check, or the stabilize spell), then the character no longer loses hit points. Each hour he makes a fort check (DC 10 + hit negative negative hit point total) to become conscious and disabled (even though his hit points are still negative). If the character became stable on his own and hasn’t had help, he is still at risk of losing hit points. Each hour he makes a fort check (DC 10 + hit negative negative hit point total) to become conscious and disabled. Otherwise he loses 1d4 hit points. He remains stable unless this damage kills him. While unconscious a stable character does not heal naturally. A character's death threshold is their constitution score plus their character level. If a creature suffers enough damage to bring their negative hp total your death threshold or beyond they die. "Don't speak save your strength"
At the DM's option a dying creature can regain consciousness sufficiently to moan a few last words, in some cases these may be lucid statements, perhaps cursing its foes, in other cases they are merely inane ramblings. In doing so the creature automatically fails its dying Fort Save at the end of its turn and suffers 1d6 damage. Last words are scarcely louder than a whisper, can only be heard by adjacent characters during combat. and although the creature may speak it may not cast spells or activate magic items. A creature who suffers damage sufficient to kill it outright of fails its third stabilization fortitude save may summon the remainder of it's strength to issue a single word or phrase up to 1d4 (plus the creature's Wisdom modifier if any) syllables in length before it expires. Unlike last words these sylables may be used to cast spells or activate magic items but the creature must succeed at a DC 30 caster level check. The diehard feat has been revised to reflect the changes to the dying rules. You are especially hard to kill and remain conscious with even the most grievous wounds. Benefit: When reduced to negative hit points you begin dying however you remain conscious and may continue to make actions. Each strenuous action you undertake (see disabled) deals an additional 1d4 points of damage. As usual for a dying character, at the end of each round you must make your stabilization Fort Save but while you can perish from failed saves you cannot begin to stabilize unless you refrain from strenuous actions. If a creature suffers more damage in a single attack than the number listed for their size in the chart below, they must make a Fort Save or suffer massive damage. The difficulty class of the fortitude saving throw is 15, this is increased by +2 for every ten points of damage beyond the listed threshold. Which ever portion is struck is effectively mutilated or outright removed. Limbs are severed or rendered useless by such a blow. Head wounds will result in death except in the case of multi-headed creatures, golems, plants, and other creatures at the discretion of the DM. 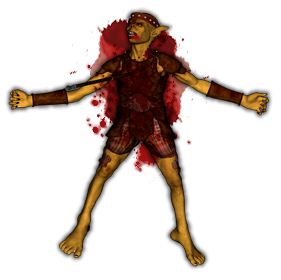 Every wound from massive damage, including head wounds, inflicts 1d6 bleed damage per round to living creatures beginning the turn after the injury. Creatures who lose the use of an arm lose weapon attacks or shield bonuses as would be expected. Head wounds will result in death, save in the case of multi-headed creatures, golems, plants, and other creatures at the discretion of the DM. A regenerate spell is needed to remedy lost or damaged limbs, it also stops bleeding instantly. Some creatures such as trolls may have special abilities which regenerate limbs, often by virtue of the regenerate ability. Critical hits increase the chance that a given creature will sustain massive damage by virtue of the higher amount of damage which they inflict but otherwise they have no special effect on massive damage. Even an average blow from a powerful creature may squash a smaller one like a bug. Damage inflicted by a vorpal weapon is treated as double for purposes of resolving massive damage. This doubling is not subject to the ordinary rules for doubled doublings, and incorporates all weapon damage. Thus, a medium sized character, who suffers 29 points of damage from a vorpal longsword is treated as though they took 58 damage for the purposes of massive damage; they must make a DC 15 fortitude save to resist massive damage. The same character critically hit with a vorpal axe for a base 52 damage would save as though he had received 104 damage, a DC 25 fortitude save. Vorpal weapons have no special effect on critical hits although they tend to be much more effective when these occur.